Eye Health Starts with What You Eat! We all know that vitamins are good for us; however, taking daily supplements isn’t enough to keep our bodies completely healthy. Eating right is crucial to our overall well-being, but what many people don’t know is that certain foods can also promote great eye health. 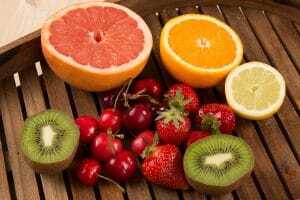 In observance of National Fruits and Vegetables Month, we have compiled a list of vitamins below that are beneficial for your eyes and how to add them to your diet. Vitamin A protects the surface of your eye and can also decrease your risk of getting macular degeneration, an age-related eye disease. This helpful vitamin is found in carrots, sweet potatoes, spinach, and kale and can also help your immune system, so it is important not only for your eye health but also for your overall health. Vitamin C is great for your eyes and your immune system. It strengthens your retina and can help reduce the risk of cataracts after long-term use. Since we cannot produce vitamin C ourselves, it is important that we get enough of it in our diet. Vitamin C is prevalent in oranges, grapefruit, cantaloupe, and strawberries. Vitamin E is a powerful antioxidant and can help in preventing cataracts. Make sure to add almonds, sunflower seeds, hazelnuts, and avocados to your diet, as they are all great sources of vitamin E.
Did you know that zinc can help you to see better at night, as well as reduce your risk of vision loss? Zinc ensures that both vitamins A and E, which are also great for eye health, work properly. You can find zinc in beef, lobster, and yogurt. The key to great eye health is in the refrigerator! By including these foods in your diet, you can support your overall health all season long. For more information on eye health and how to improve your diet, schedule an appointment with Valley Eyecare Center.